View of the Hatfield Marine Science Center and NOAA dock as the Shimada pulled away. Last of the bridge we’ll see for some time. We finally weighed anchor and set sail at 1032 Friday morning. 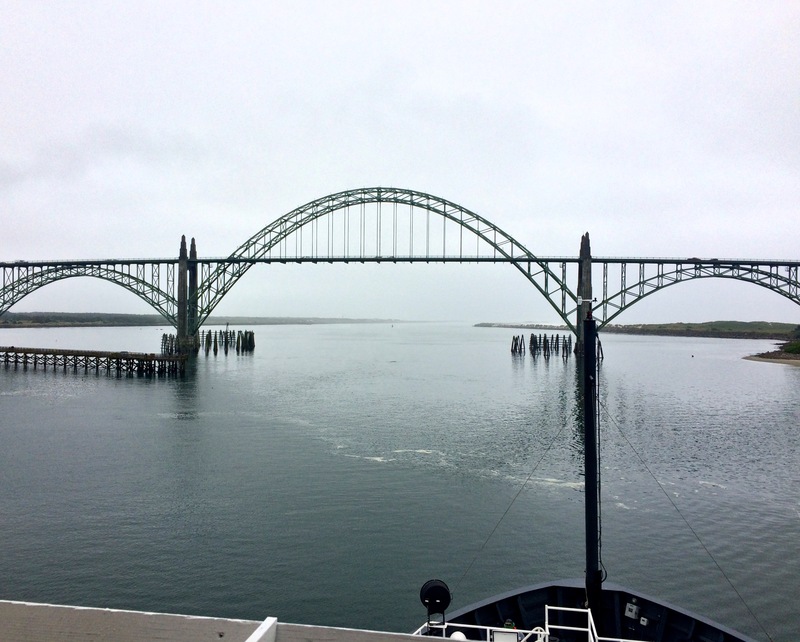 Fog blanketed the shores of Newport as we passed below the Yaquina Bay Bridge and out into the channel created by the North and South Jetties. One of our last sights from shore was Chief Scientist Ric Brodeur’s wife, who had come to see us off. The fog was so thick that before we had even reached the end of the jetty her lime green jacket was hidden from view. Emily and I and several of the other scientists watched our departure from the flying bridge, the highest observational deck on board the ship. It provides an almost unobstructed 360-degree view of the surroundings—making it perfect for Amanda’s surveys—but it’s also right next to the foghorn, which had to be blown every two minutes until we reached greater visibility. Needless to say, we all found somewhere else to watch the waves. Visibility was low as we left Newport. 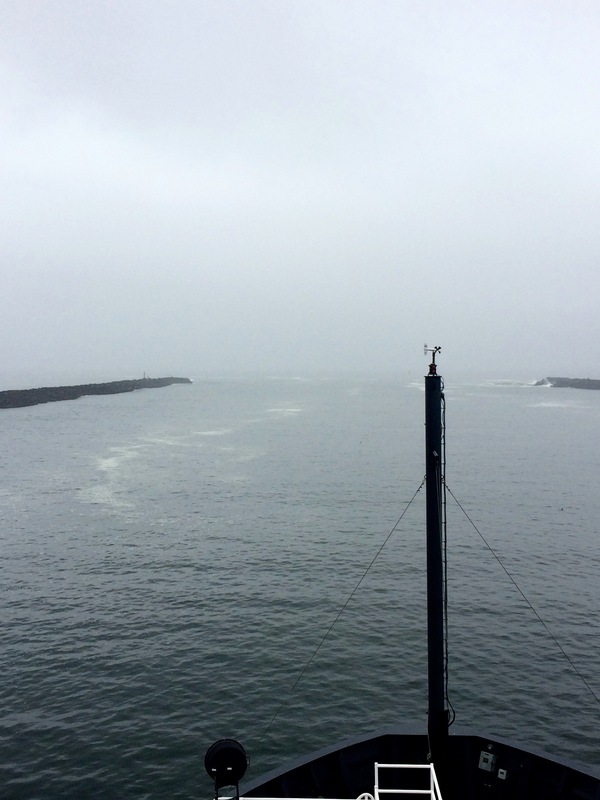 Once the ship had moved farther offshore, some of the fog cleared but the moisture in the air was still enough to cause concern for the computers so Amanda went to the bridge, an enclosed deck that houses the navigational instruments that the captain and other officers use to drive the ship. Here she began setting up her survey equipment. Up to this point, I’d been getting a lot of great advice about handling the first few hours on board the moving ship. Some people suggested I lay down, but the go-getter in me wanted to work. 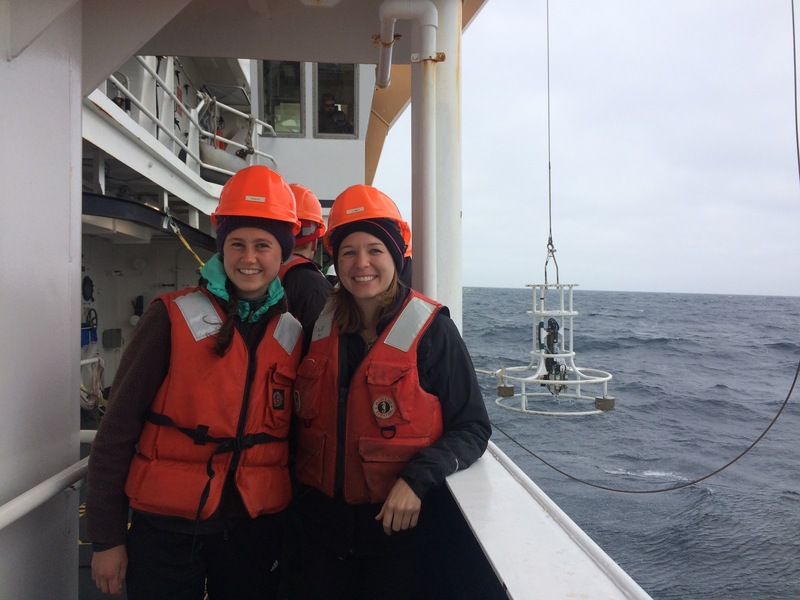 Using a program that is linked to the ship’s GPS, Amanda taught me how to code the observations she was making of the seabirds and marine mammals. As she kept her eyes glued on the 90-degree quadrant made by making a quarter port (while facing the front of the ship, counter clockwise or left, for you digital folks) turn from the bow (front of the ship) (in the image at the top of this post, you can see a panoramic view of quadrant I, the port bow of the ship), she would call out codes for the species, distance from the ship and behavior of the bird she observed. If she were to spot any marine mammals–pinnipeds (pin-eh-peds) (seal and sea lions) or cetaceans (ceh-tay-shins) (dolphins and whales)–that gets entered in a separate database. Amanda surveying from the flying bridge. Amanda has to be prepared to work alone as she is the only ornithologist on the ship, but with a Teacher at Sea and other volunteers on board willing to learn and help out, she’s able to rely on us to share some of the work. She and I were working as quite the well-oiled machine for a solid 20 minutes before I made peace with the fact that I did not have my sea legs. To my great relief, it’s something you can sleep off. While at sea, the most important thing to remember is to be safe, so once we had been underway for a few hours, the ship’s crew and team of scientists went through drills to practice safety protocols for two of the three significant events that could happen at sea. A 10-second blast on the horn sounded the alarm for the fire drill, and all crew and scientists mustered (gathered) in their assigned locations. Next, 7-short, and 1-long blast signaled the start of the abandon ship drill. The need to abandon ship is highly unlikely, but out at sea you need to be prepared for anything. Most importantly, you need to know how to get into your survival suit, and fast. Emily and I decided to practice since we were both first-timers to these impressive red neoprene onesies. Since they’re designed to be large enough to fit over your shoes and warm clothes, they can be awkward to put on, especially when you get to the zipping part. And who cares how they look when the water is 8-10° Celsius, a temperature that could cause hypothermia or fatal loss of body temperature. Emily and I managed to get the survival suits on! Saturday was spent sampling a little bit of everything. Of course I paid a visit to Amanda up on the flying bridge to hear about how the birding (and marine mammal-ing) was going. Often, I find Emily there assisting with data entry. Since Amanda can only survey when the ship is traveling faster than 7 knots, traveling from station to station gives her time to look, but sometimes these distances are short and our time at the stations, releasing the various equipment needed for different scientists’ data collection, can be long. This is when Amanda goes off effort (not collecting data) for longer periods of time and during these times, Emily and I have taken to teaming up to check out what’s going on in the wet lab. Jaclyn releases the neuston tow into the water. Home to most of the science crew, the wet lab is wet. Initially, I thought foul weather gear was meant for, well, foul weather, but between the hauling in, spraying down and rinsing of the samples caught in the nets, everyone in the wet lab is wearing theirs full-time. Also, everyone must wear hard hats and PFDs (personal flotation devices, also known as life jackets) when out on deck as the equipment is being released or hauled in. Safety first, as always! 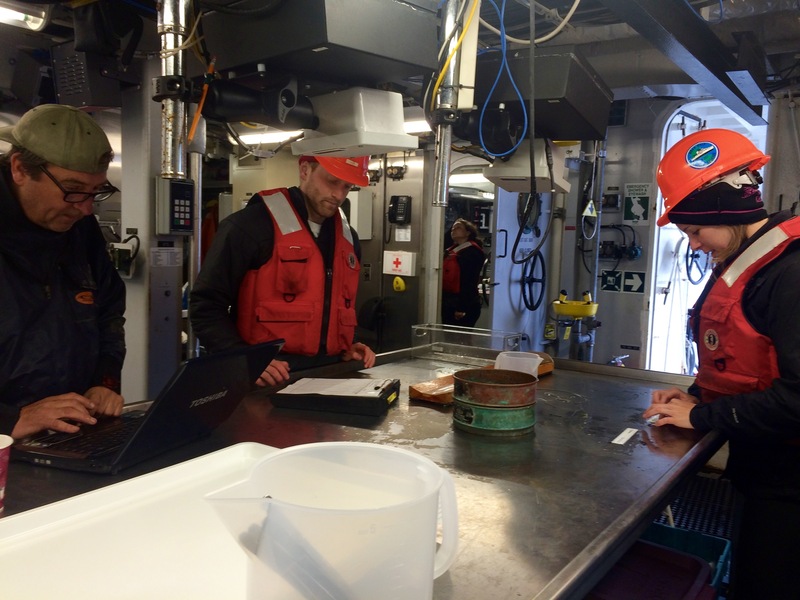 My cabin mate, Jaclyn Mazzella, and Phil White, are the two survey technicians on the Shimada. They help release and monitor the nets and equipment that are being used on this research cruise. More on these two interesting cats later. Emily and I working hard to haul in the CTD. While in the wet lab, Emily and I witnessed the CTD being hauled in. CTD stands for conductivity, temperature and depth. Conductivity is a measurement of salinity, or how salty the ocean water is. The way it works is by passing an electric current through the water and measuring how fast it travels. This is connected to how salty the water is because when salt is dissolved in water, it separates into ions, these particles carry a charge and allow electric current to pass through. More conductive water will be salty, less conductive water will be less salty or fresh. We know that temperature provides a measurement of how hot or cold something is. In this case, we’re measuring the temperature of the water. 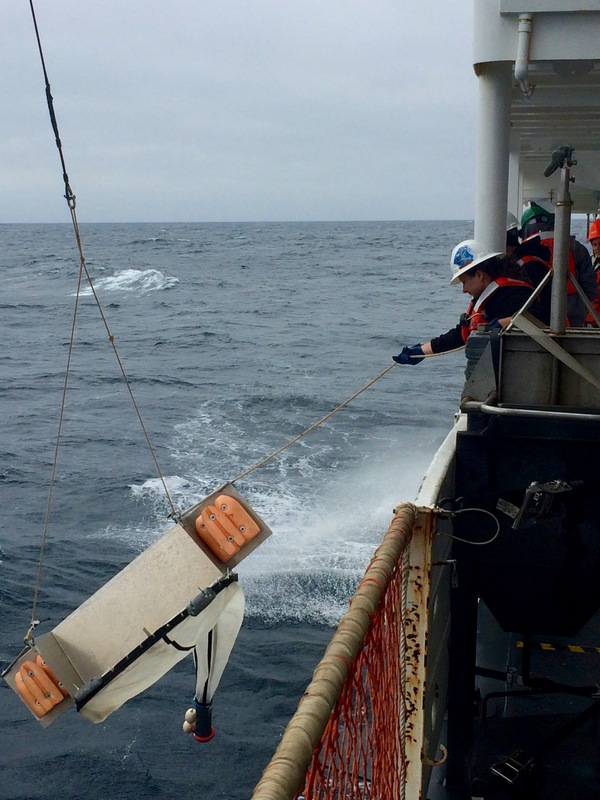 It is mostly cold off the Oregon coast, though the scientists on board have been discussing a recent unexplained area of warmer water, dubbed the “warm blob.” Biologists aim to discover if the warm blob is going to have an impact on the fisheries. As the CTD is lowered and raised, it can take measurements of these and other factors which allow biologists to compare the diversity and number of species they collect in their nets to the data collected. One of those nets is the neuston tow, a net that skims the surface of the water. It is one of several nets that are being used to collect samples from different layers of the ocean. The scientists on board expect to find jellies and larvae of different species in this net. Curtis filters the cod-end of the neuston and finds a whole bunch of Vellela vellela. I got a chance to see the neuston being released. 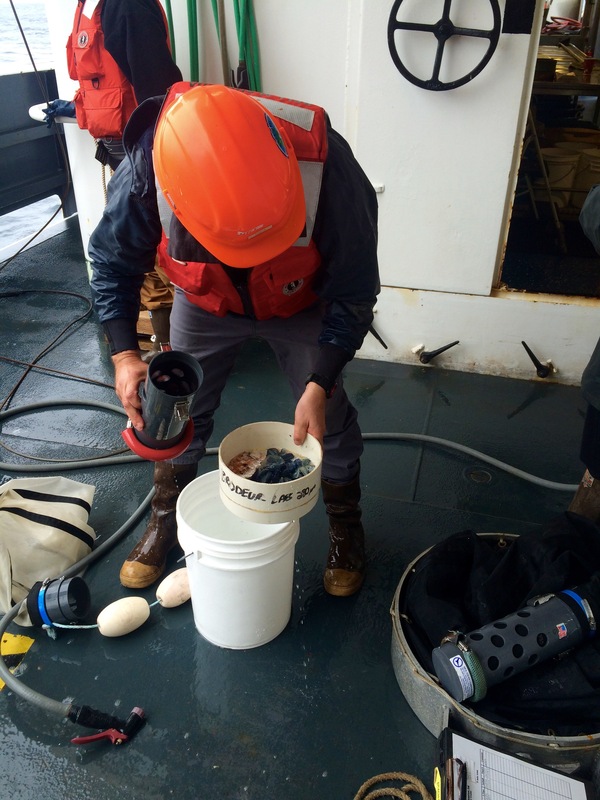 After it was hauled in, Dr. Curtis Roegner, a fisheries biologist with NOAA, detached the cod-end–a small container at the bottom of the net that collects everything the net caught–and filtered out the contents. Inside were a bunch of beautiful blue jellies! These guys are commonly known as by-the-wind sailors thanks to their interesting sail adaptation that allows them to harness the power of the wind to aid in their dispersal (scattering) throughout the ocean. 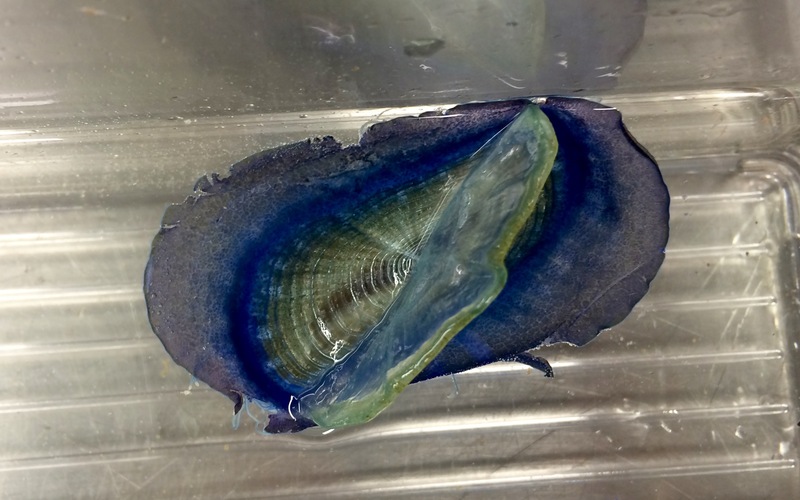 I helped Sam Zeman, a biologist with the University of Oregon, Tyler and Curtis measure the diameter–the length at the widest point–of the bodies of the jellies. Vellela vellela, by the wind sailors. The more time I spend on the Shimada, the more determined I am to figure out how time travel works so I can go back and thank my September 2014 self for putting in the Teacher At Sea application. I’ve been on the ship for three days now and I love being able to go anywhere, day or night, and be able to observe and assist in research and data collection, but also just sit and talk with people who have all followed many different paths that led them to this ship, for these two weeks. You might think my biggest struggles right now would be seasickness (which I’m not!) or missing my friends and family, but honestly, the hardest part is keeping the blog down to a readable length. There’s an enormous amount more happening here than I have the room to tell you but I will try and cover everything before our time is up. Lastly, it’s true, I miss my friends and family, a lot, but there are certain creature comforts here that help ease the transition from land to sea. NOAA certainly knows how to keep morale and productivity up, with a well-stocked kitchen open 24 hours, meals prepared on site by talented cooks, and a TV lounge for socializing with a selection of over 500 movies, it’s easy to feel at home. And when finding a work-life balance is not possible, it’s necessary, all of this helps. Well, that’s all for now, catch the next installment coming soon to a computer screen or mobile device near you! Special thanks to Prof. Mary-Beth Decker consulting on the spelling of Vellela vellela and Brittney Honisch for teaching me a good way to remember port vs. starboard. When facing the front of the ship, port is left and both words have four letters. 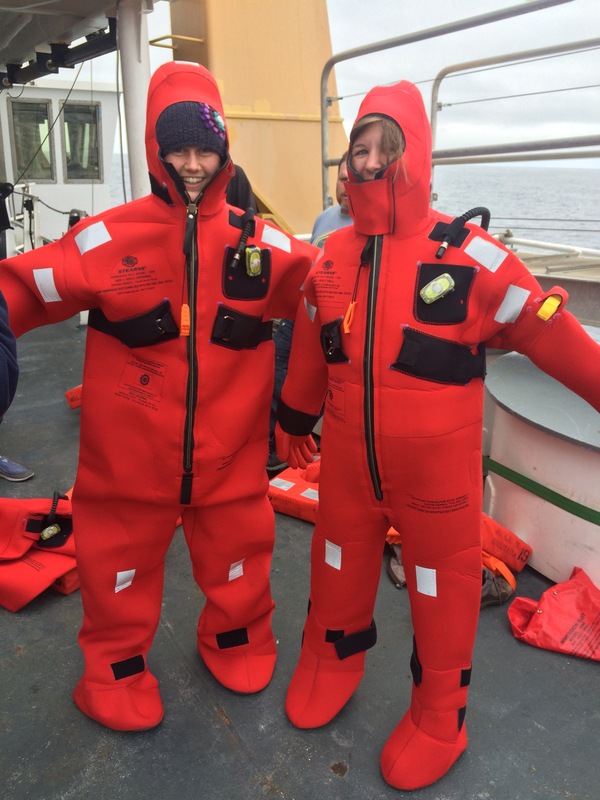 This entry was posted in 2015, Alexandra Miller, NOAA Fisheries Service, NOAA Teacher at Sea and tagged CTD, data collection, data entry, National Oceanic and Atmospheric Administration, Neuston Tow, NOAA Ship Bell M. Shimada, oregon coast, parts of the ship, survival suits, Vallela vallela. Bookmark the permalink. This is so interesting! The biology major in me wishes I were there, but you write so well that i almost feel as though I am!